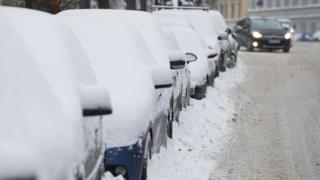 A man clad only in boxer shorts stopped a thief from stealing his car in southern Norway - by clinging on to the roof in a hair-raising ride at -17C. Police say the owner was left "pretty bloody" after the car crashed into a safety barrier on a bridge. A suspect has been taken into police custody. The owner, 25, woke up in Kristiansand in the early hours of Wednesday when he heard his car engine firing up. He raced out, grabbed a car door-handle and refused to let go. The thief tried to shake him off by driving into the snow, but the owner clambered on to the roof of his VW Passat and clung on to the bars as the car sped off. Local police chief Jan Nesland, quoted by Norway's TV2 news, said the owner managed to hold on for several kilometres in a trip resembling something from a Hollywood action movie. The thief drove the car at up to 90km/h (56 mph), he said, but the owner managed to smash the back window with his knee and grappled with the thief before the car hit the safety barrier. "[Actor] Bruce Willis wouldn't have managed that," he said. "It's not something we would advise people to do, but now that he's done it - well, it's an incredible story," Mr Nesland said. It was one thing to smash a car window with your clothes on, but to cling on to its roof at high speed in your underwear in sub-zero temperatures was totally crazy, he added.